Maa Durga is worshipped in many different forms. 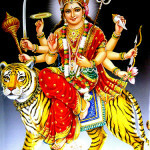 She is a form of “SHAKTI”. The evolution of Shri Maha Saraswati, Shri Maha Laxmi and Shri Mahakali (the 3 main forms of “SHAKTI”) took place from “Shri Brahma”, “Shri Vishnu” and “Shri Mahesh” respectively. 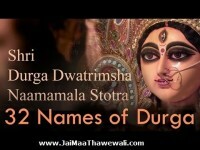 Each of these 3 deities gave rise to 3 more forms and hence in all, these 9 forms together are known as “Nav-Durga”. 1. 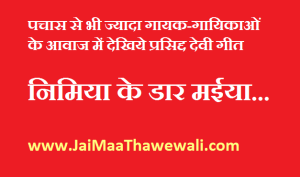 Maa Shailputri – The Navratri commences with the 1st night devoted to the puja of Maa “Shailputri”. “Shail” means mountains; “Parvati”, the daughter of king of Mountains Himavan, is known as “Shailputri”. HER 2 hands, display a trident and a lotus. She is mounted upon a bull. 2. Maa Bhramcharni – One hand holds a “Kumbha” or water port and the other rosary. She personifies love and loyalty. Maa Bhramcharni is store-house of knowledge and wisdom. Rudraksha is her most adorned ornament. 3. 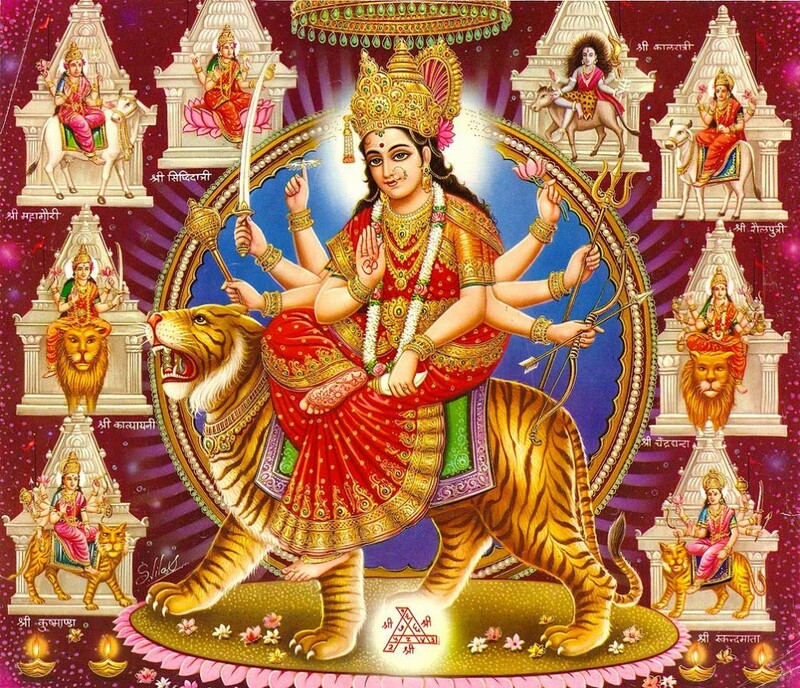 Maa Chandraghanta – Worshipped on the 3rd night this Maa Durga “SHAKTI” is astride a tiger, displays a golden hue to HER skin, possesses ten hands and 3 eyes. 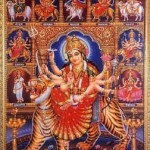 Eight of HER hands display weapons while the remaining two are respectively in the mudras of gestures of boon giving and stopping harm. Chandra + Ghanta, meaning supreme bliss and knowledge, showering peace and serenity, like cool breeze in a moonlit night. 4. 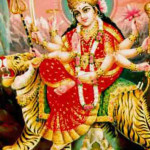 Maa Kushmanda – The 4th night begins the worship of Maa “Kushmanda”, possessed of eight arms, holding weapons and a mala or rosary. Her mount is a tiger and She emanates a solar like aura. 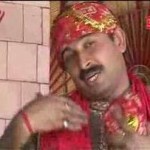 “Kumbh Bhand” means to see cosmic vivacity in Pindi shape or knowledge of cosmic intricacies in human race. The abode of Maa “Kushmanda” is in Bhimaparvat. 5. 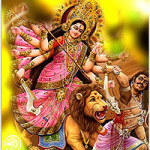 Maa Skandmata – Using a lion as a vehicle She holds her son, “SKAND” in her lap while displaying 3 eyes and 4 hands; two hands hold lotuses while the other 2 hands respectively display defending and granting gestures. 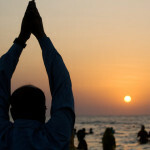 Its said, by the mercy of Maa “Skandmata”, even the idiot becomes an ocean of knowledge such as “Kalidas”. 6. Maa Kaatyayani – As mother, Maa “Kaatyayani” stayed in the Ashram of sage Katyayan for penance, hence She named as “Kaatyayani”. 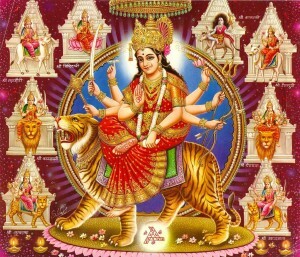 This 6th Shakti is also astride a lion with 3 eyes and 4 arms. One left hand holds a weapon and the other a lotus. The other 2 hands respectively display defending and granting gestures. Her complexion is golden coloured. 7. Maa Kaalratri – Black skin with bountiful hair and 4 hands, 2 clutching a cleaver and a torch, while the remaining 2 are in the mudras of “giving” and “protecting”. She is mounted upon a Donkey. The destroyer of darkness and ignorance, Maa “Kaalratri” is the seventh form of Nav-Durga meaning scourer of darkness; enemy of darkness. Maa Kaalratri’s famous shrine is in Calcutta. 8. Maa Mahagauri – Four arms with the fairest complexion of all the Durga Shaktis. Peace and compassion radiate from Her being and She is often dressed in a white or green sari. She holds a drum and a trident and is often depicted riding a bull. 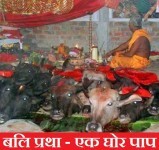 Maa “Mahagauri can be seen in a temple at Kankhal near pilgrim centre Haridwar. 9. Maa Siddhiratri- Ensconced upon a lotus, most commonly, with 4 arms, and is the possessor of 26 different wishes to grant Her bhakts. Maa Siddhiratri’s famous pilgrim centre, is located in Nanda Parvat in the Himalayas. 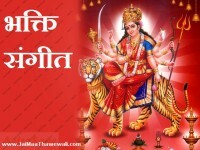 Tagged maa durga, maa thawewali. Bookmark the permalink.